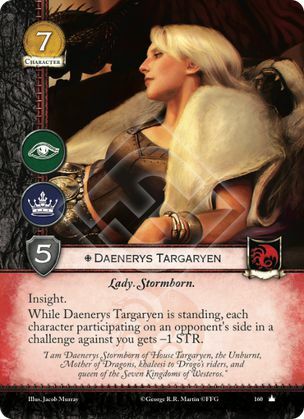 While Daenerys Targaryen is standing, each character participating on an opponent's side in a challenge against you gets -1 STR. "I am Daenerys Stormborn of House Targaryen, the Unburnt, Mother of Dragons, khaleesi to Drogo's riders, and queen of the Seven Kingdoms of Westeros." Strength modifiers that last until the end of a challenge, such as For the North!, expire simultaneously with the characters ceasing to participate in step 4.2.6. There is no conflict to be decided by the first player. Let's take the example of a base 5 strength character like Robb Stark, and say he has +2 strength from For the North, -1 strength from Daenerys Targaryen, and -4 strength from Dracarys. During the challenge has has 5+2-1-4=2 strength. When the challenge ends, he has 5-4=1 strength. At no point does he have zero strength. Also note that Daenerys has a "global" effect that affects each character participating on an opponent's side, but once she decides to participate in a challenge (which involves, for her, kneeling), it switches off. The same can be said for when she's used to pay the cost of "Dracarys". However, there are a number of methods to stand her in-faction; the Handmaidens, Rhaegal, Waking the Dragon and Magister Illyrio, as well as the neutral available Seal of the Hand and Power behind the Throne. Using these you could use Dany in a challenge (as an attacker or defender), and then stand her. She'll still be participating in the challenge, but her global effect will also still be active.